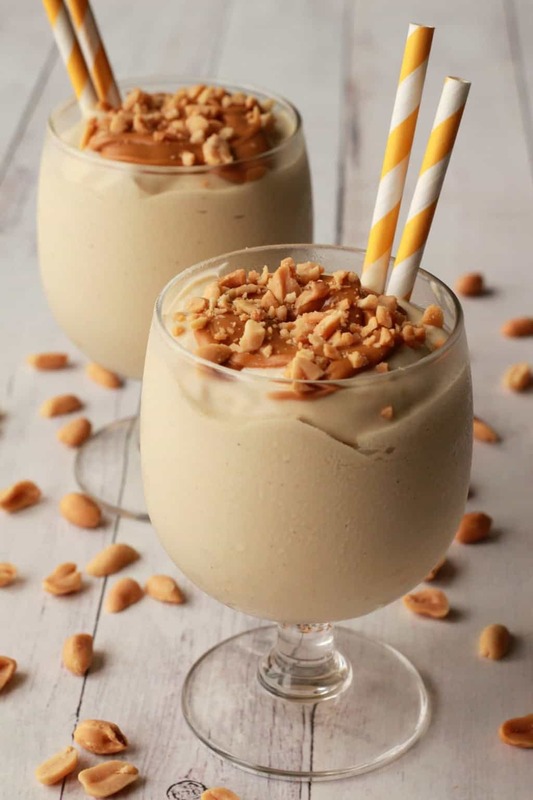 Oooooh this peanut butter milkshake is soooo good. It’s actually ridiculous how good it is. Don’t make this unless you’re ready for some serious indulgence. I mean it’s not in the same category as the chocolate peanut butter smoothie I made before. That was a blend of bananas, cocoa powder and peanut butter and as such is something you’d have for breakfast. 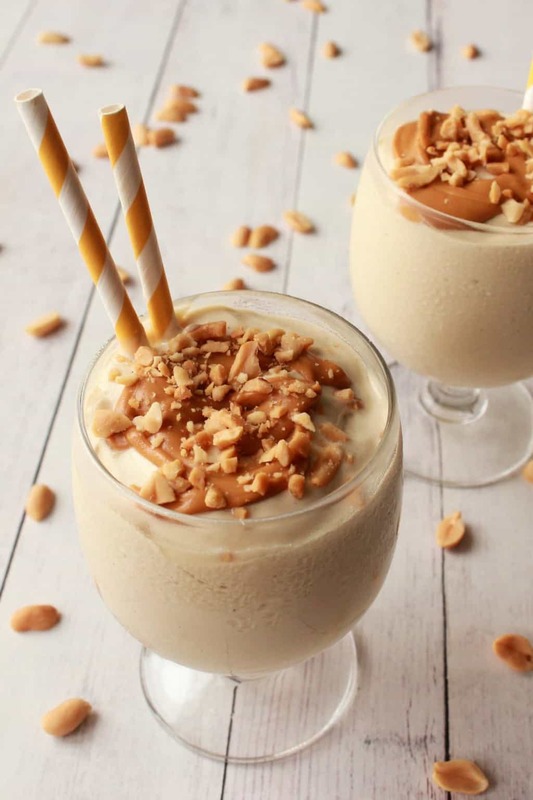 This peanut butter milkshake is in a league of its own. It falls squarely in the ‘dessert’ category, and not just any dessert but ‘super indulgent decadent dessert’. 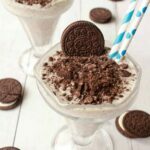 If you have the ingredients on hand and are not planning to make the ice cream from scratch first, then this milkshake comes together in 5 minutes flat. Just a quick 5-10 minutes standing between you and utter bliss through a straw! Pretty tempting isn’t it? 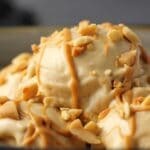 It’s a simple blend of vegan vanilla ice cream (homemade or store bought), non-dairy milk and peanut butter. 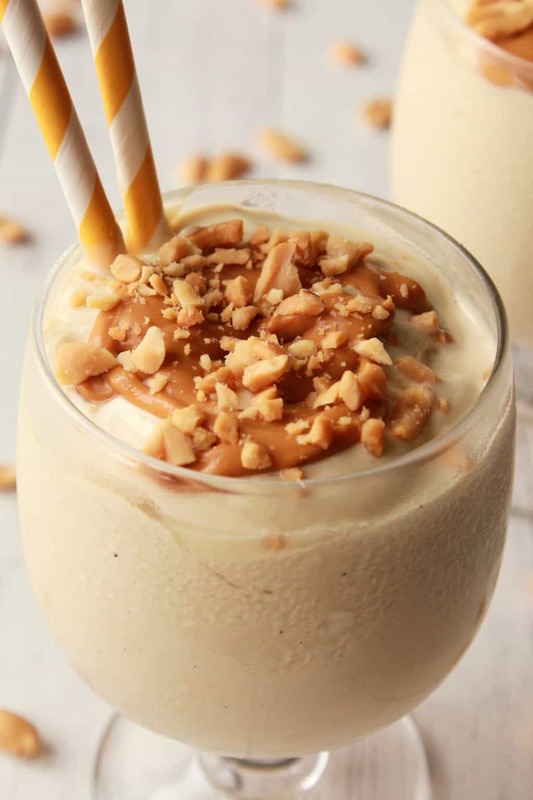 Whizz it up in the blender and then top it with melted peanut butter drizzle and crushed peanuts. 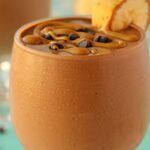 It’s a ridiculously thick, double thick shake – you can eat it with a spoon if you prefer! 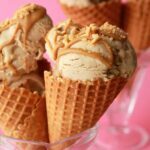 Topped with melted peanut butter and crushed peanuts! 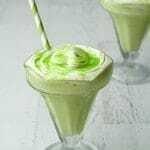 Blend it up and drink it right away. While this isn’t a shake that oxidizes, it’s still best when fresh as the texture and double-thickness is at the perfect stage of perfectness! Oh and my grammar is just amazing. Just a stray observation there. 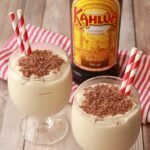 So let me know your thoughts on this delicious vegan milkshake! If you have questions, fire away! Tag any pics #lovingitvegan on instagram, I simply LOVE seeing what vegan goodies you’re whipping up in your kitchens out there! And – if you haven’t already (which would be cray-ay-zay) – sign up to our mailing list! You’ll get a free ebook with 10 fabulous recipes, plus you’ll keep up with all the latest recipe postings to the blog. Yip Yip! That’s good stuff. 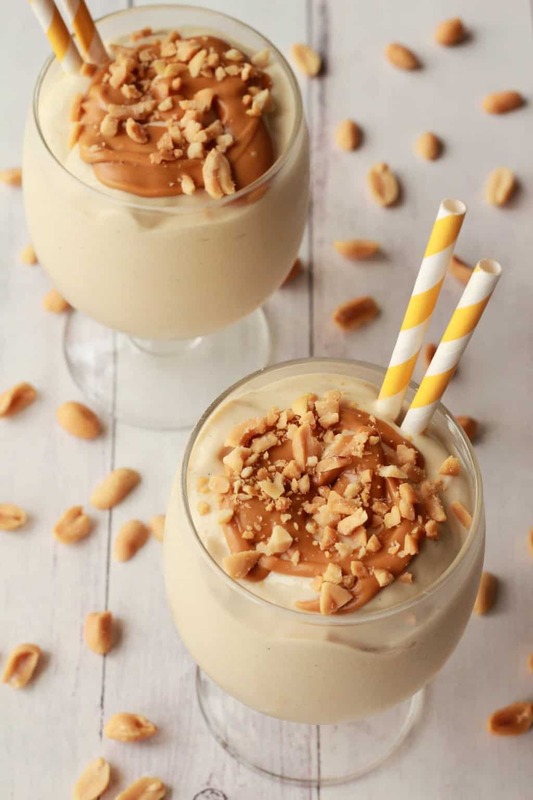 Double-thick vegan peanut butter milkshake. 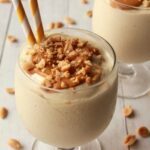 This decadent milkshake is ultra creamy, smooth and rich, packed with peanut butter flavor and topped with melted peanut butter and crushed peanuts. 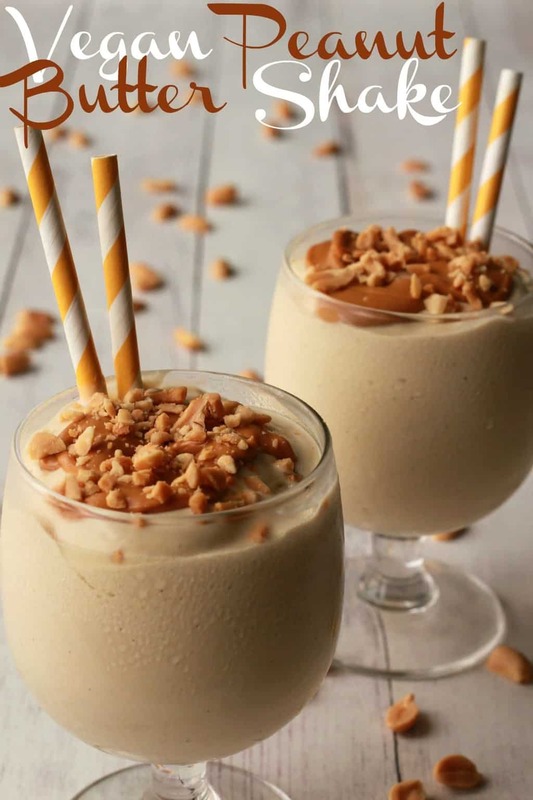 Add the ice cream, peanut butter and non-dairy milk to a blender jug and blend until smooth. Pour out into two glasses. Melt the peanut butter by heating it for 30 seconds in the microwave. 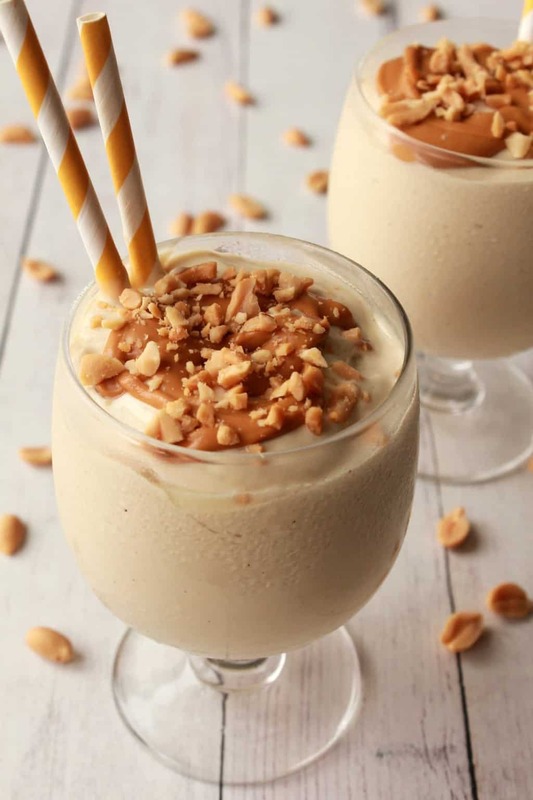 Drizzle peanut butter on top of the shakes and top with crushed peanuts. my fella is a peanut butter freak. I’d love to surprise him with a big frosty glass of this! Decadent, vegan and incredibly tasty! I tried this recipe with Soy-Vanilla Icecream and Almond-milk and wow… it tastes soo freaking delicious.